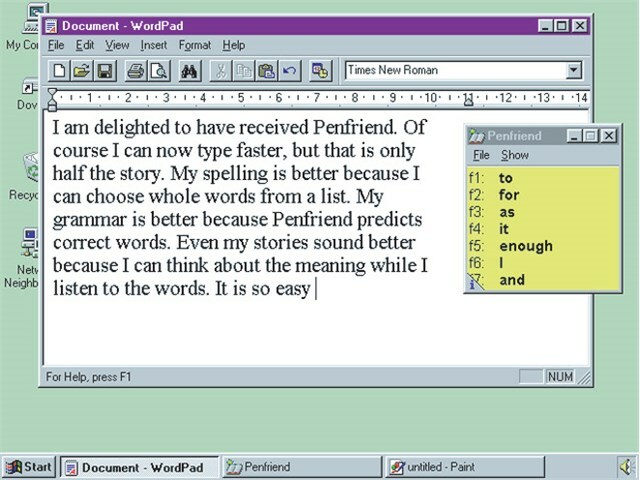 Penfriend XP is a powerful tool for those with dyslexia or physical disabilities, adding word prediction, speech and an on-screen keyboard to almost any other software. Now with even better prediction, new display options and much improved abbreviation expansion. Works with your word processor and tries to guess the word you are typing when you have entered the first letter, the second letter and so on. One key press then finishes the word for you. It also learns the words you use frequently and recently, so it improves as you use it. This information is saved for each individual user, together with individual settings. In addition, it is easy for teachers to select preferences, edit children’s lexicons and add topic specific vocabulary.